Page added in January 2019. Photos taken with Canon Powershot SX 700 HS in May 2016. 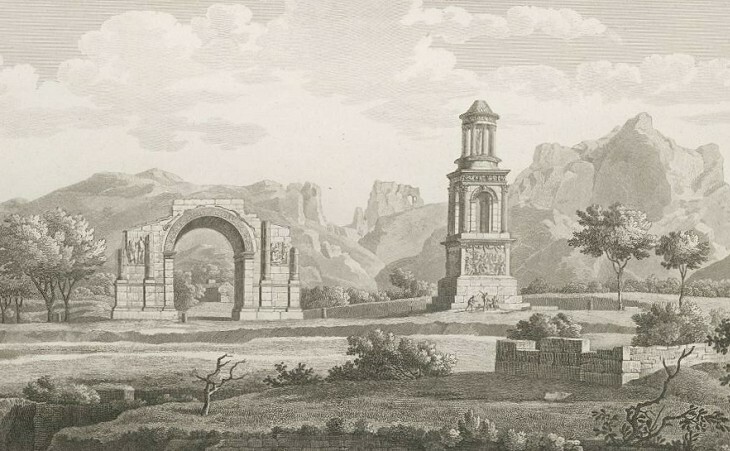 Arch and Mausoleum of the Julii and the Alpilles in the background: plate from "Alexandre de Laborde - The Monuments of France Chronologically Classified - 1816-1836"
From Avignon we crossed a marshy country and the river Durance to St Remy, a town built about a mile from the ruins of Glanum Livii. I was not able, during our short stay, to discover any other vestiges of the city than the two pieces of antiquity which had induced us to quit the post road; one is a mausoleum, the other a triumphal arch; they stand a few yards distant from each other, but it does not appear to me that there ever was any connection between them, as is pretended by some authors, who think that they were erected by the same persons, and in the Augustan age. In my opinion they were built at very different periods of the art, the sculpture and architecture of the arch being much more chaste and perfect than those of the mausoleum. Saint Remy is a small town agreeably situated and has a population of 3000 inhabitants. 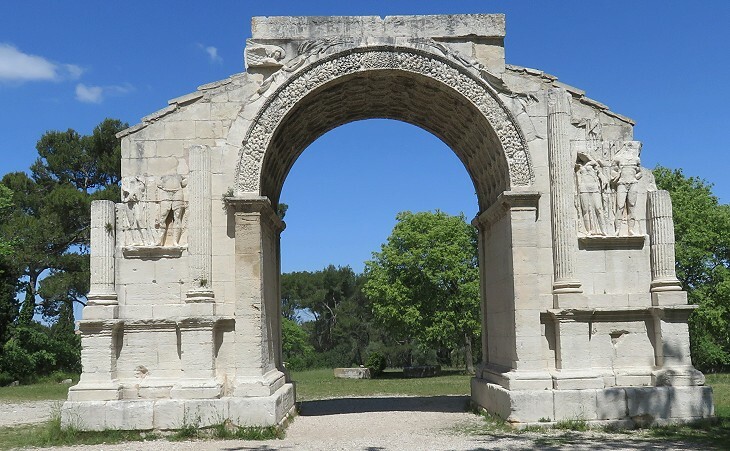 About half a mile from the town is the site of Glanum Livii, a town which exists only in name, where are two Roman monuments of great beauty which have survived the fury of the revolution; there is a good road to them. These monuments survived not only the fury of the French Revolution, which by the way did not target the ancient Roman monuments, but also those of the early Christians, of the Goths, of the Moors, of the Protestants and in addition the daily pilfering by ordinary people in search of construction material. Maybe the beauty of the monuments had an awe-inspiring impact on those who saw them. Nostradamus was born at Saint-Rémy in 1503 and he made some cryptic references to the Mausoleum in his prophecies, but La Guide des Chemins de France written in 1553 by Charles Estienne and Galliae accurata descriptio, a detailed guide of France published in 1659 did not mention the two monuments, something which suggests that they were not widely known. They were situated near Avignon, but Saint-Rémy was not part of Comtat Venaissin, the Papal fiefdom to the east of the town, and probably Grand Tour travellers had practical difficulties in reaching them from Avignon. Their description by Swinburne is perhaps the first one in English. They were sketched in 1760 by Jean-Honoré Fragonard and they appear in the background of a large 1789 painting by Hubert Robert showing the Roman monuments of Nîmes and Orange. Both painters studied together at the French Academy in Rome and became expert in making "landscapes with ruins", a genre which had a large market. From Tarascon an excursion may be made to St Remy 10 m, a deserted town, remarkable only for two well preserved Roman buildings, detached from all others. 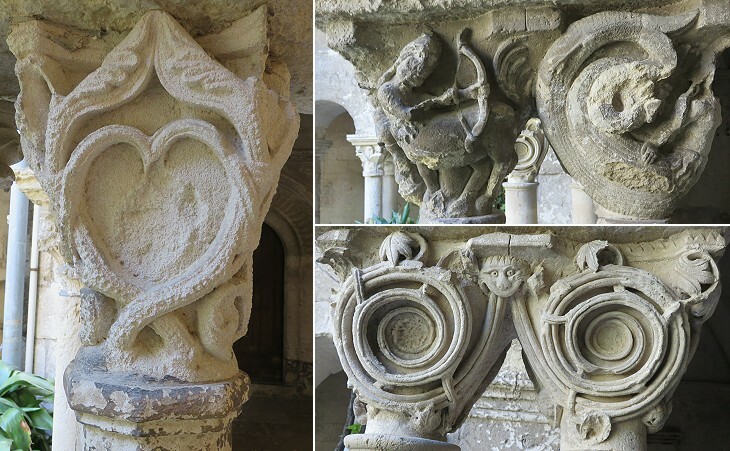 The Arch of triumph is less perfect, having lost its upper story, but the stones of its vault remain beautifully carved, in hexagonal compartments or sunk pannels. (..). The date of this monument is as little known as that of the other; it has been supposed to commemorate the victories of Marc Aurelius. St Remy was the ancient Glanum. 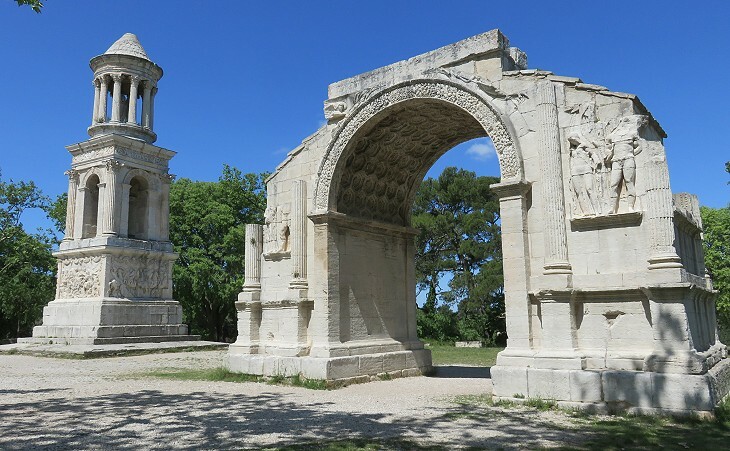 Contrary to the prevailing opinion in the XIXth century Saint-Rémy was not the ancient Glanum, the remains of which were covered by a landslide. They stood to the south of the Arch and they began to be excavated in 1921 (see page two). 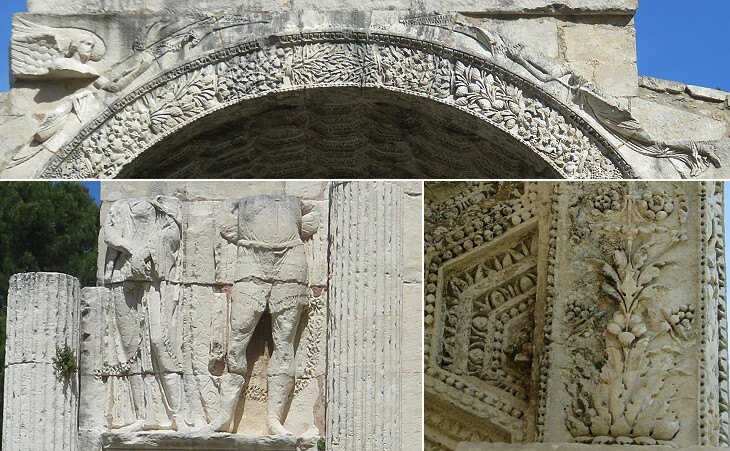 Inscriptions indicate that a temple was built in the town at the initiative of Marcus Vipsanius Agrippa, son-in-law of Emperor Augustus, and most archaeologists believe that also the Arch was erected by him or shortly after he left Gaul in 19 BC. 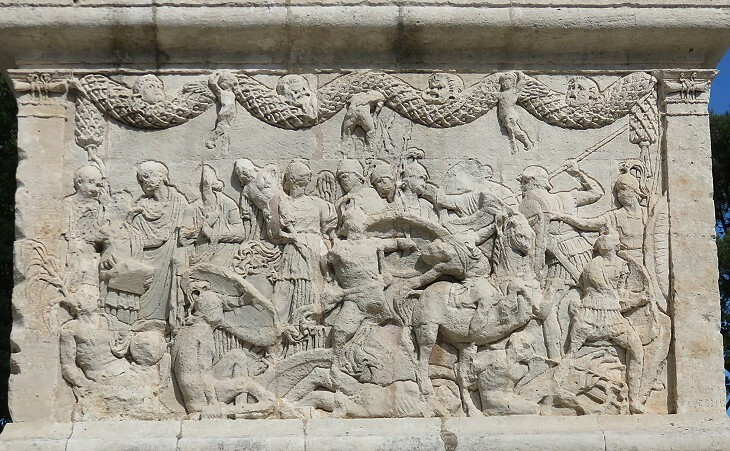 Reliefs showing tied captives can be seen also on the short sides of the Arches of Orange and Carpentras. 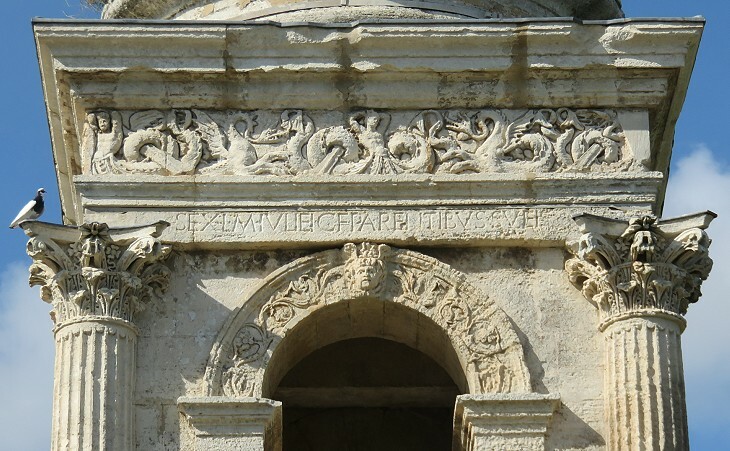 Today archaeologists believe that the Mausoleum was built before the Arch and that the Caius Julius mentioned in the inscription was a local commander who supported Julius Caesar in his conquest of Gaul. 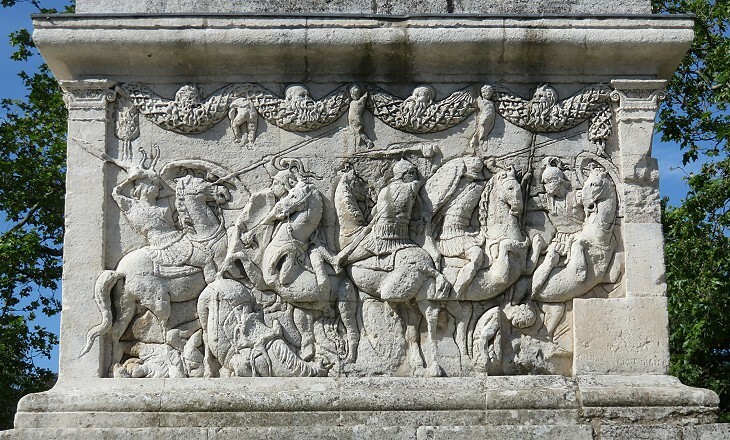 This relief always puzzled viewers because it shows two different events: to the left a family group listening to an announcement and to the right a scene of combat; today they are interpreted as: a) the announcement of the granting of Roman citizenship to Caius Julius, the local commander; b) a scene of the Battle of Zile in today's Turkey, shortly after which Caesar was named Imperator and granted Roman citizenship to many of his supporters (and most likely Caius Julius fought there). 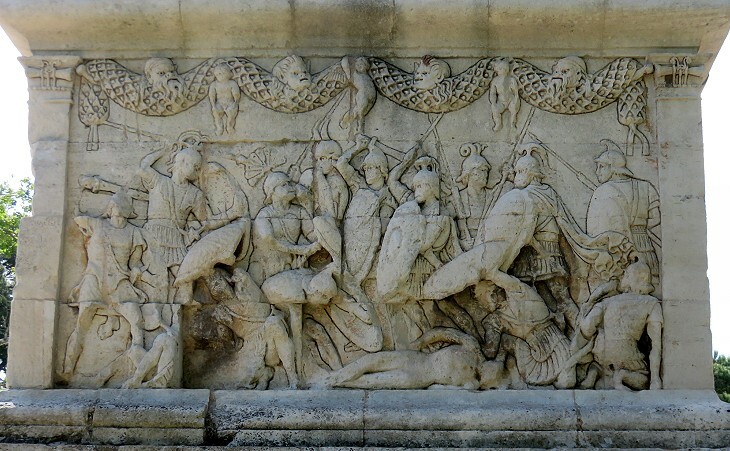 All the scenes of fight were very well executed; they are all thought to illustrate the Battle of Zile, the outcome of which Caesar communicated to the Senate with the words Veni, vidi, vici (I came, I saw, I won); the design of this scene was influenced by those depicting battles between Greeks and Amazons which were a very popular subject (see reliefs on sarcophagi at Rome (A) and (B) and at Kutahya in Turkey). This relief was influenced by those depicting episodes of the Iliad in which Greeks and Trojans fight over the body of Patroclus, or Sarpedon or another famous warrior. 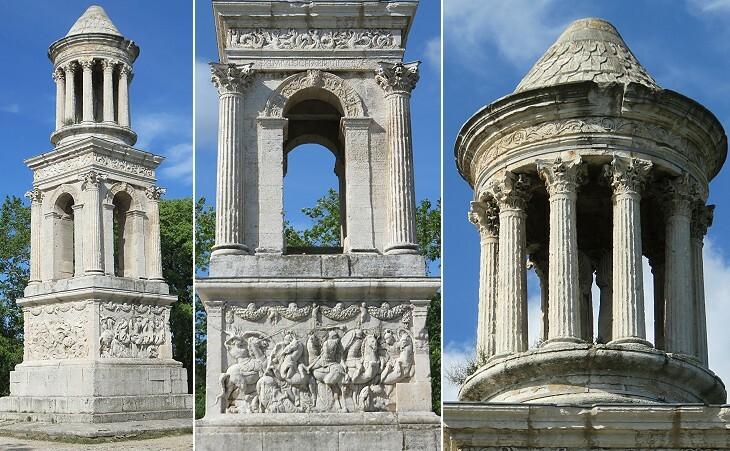 You may wish to see some other mausoleums which resemble that at Glanum, e.g. Igeler Saule (Column at Igel) near Trier in Germany, the Tomb of the Scipios near Tarragona, the Tomb of Theron at Girgenti in Sicily, the Tomb of Absalom at Jerusalem, a mausoleum at Thugga and a mausoleum at Aquileia which was reconstructed bearing in mind that at Glanum. A XIIth century monastery was named after the nearby Mausoleum of the Julii. 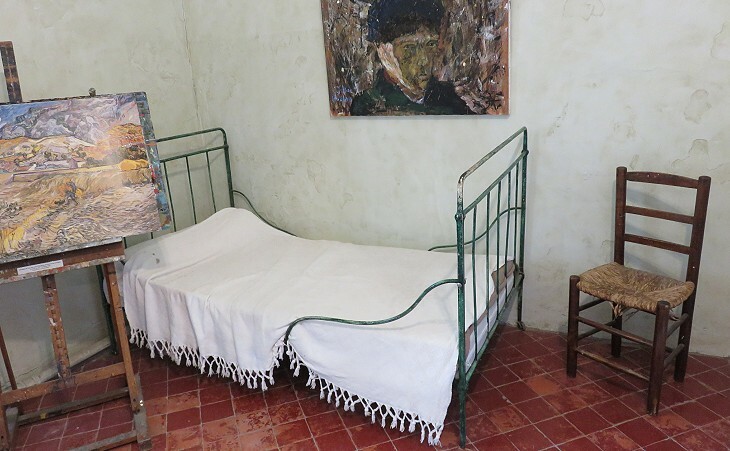 Today it attracts more visitors than the ancient monuments because in 1889-1890 Vincent Van Gogh spent a year there, when it housed a mental asylum. During his stay he painted some of his best known canvases. 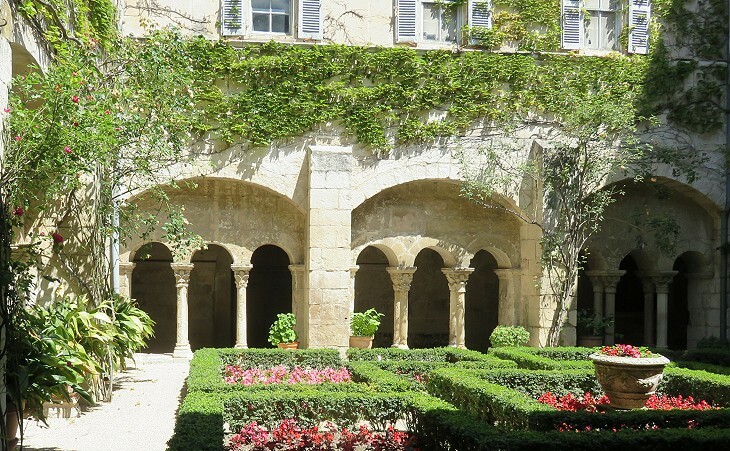 The monastery retains a fine Romanesque cloister which is very well kept and conveys a sense of peace. One wonders about the impact of the capitals of the cloister on the minds of the patients of the Asylum. Move to see The Town of Glanum.